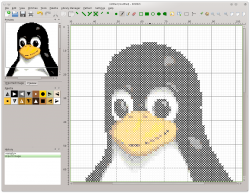 KXStitch is a program that lets you create cross stitch patterns and charts. 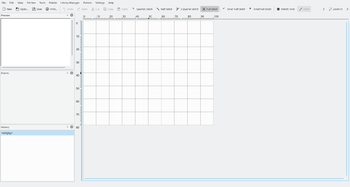 Patterns can be created from scratch on a user defined size of grid, which can be enlarged or reduced in size as your pattern progresses. 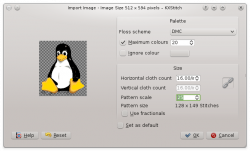 Alternatively you can import images from many graphics file formats which will allow you to reduce the number of colors and to restrict the conversion to full stitches or optionally use fractional stitches. You may also use images as backgrounds allowing you to trace over them. These imported images can then be modified using the supplied tools to produce your final design. There are a number of tools to aid designing your pattern, including open and filled rectangles and ellipses, filled polygons, lines and backstitching. Additionally cut, copy and paste can be used to duplicate selected areas. Selected areas can also be rotated 90, 180 and 270 degrees anti clockwise, or mirrored horizontally or vertically. Pattern libraries can be used to store small and not so small portions of patterns that can then be reused in other patterns. The patterns in these libraries are stored in a hierarchical list that makes it easy to sort and navigate them to find the ones you want. These pattern libraries can also be used as alphabets by assigning a character to each one. Using the Alphabet tool, each key press is searched for in the current library and if present, the associated pattern will be inserted in the pattern being edited. When you are ready, you can design a page layout to print out your design. There are options to print out cover sheets, instructions and a floss key including amount of thread used and number of stitches. The cross stitch chart can cover as many sheets as are required, close ups can be done for detailed sections and smaller scale views done for areas of blocked colors. 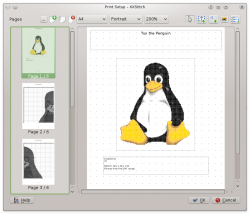 Editing of existing patterns - KXStitch is also capable of reading PC Stitch files. Creation of custom palettes and colors. For an in depth look at the feature list, check out the features page. This page was last modified on 17 January 2018, at 20:48. Content is available under Creative Commons License SA 4.0 unless otherwise noted.